In the past, Greg created wall calendars as holiday gifts only for his immediate family and closest friends. Now you can own one, too. These full-color 12-month wall calendars come in two sizes, and can be shipped to you, or directly to others as gifts. Check out my 2019 “Views from the Flying Carpet” aerial photo wall calendars, filled with recent aviator’s-eye views from around the country. This calendar comes in two sizes,* featuring recent aerial photographs from my “Views from the Flying Carpet” series of Fine Art Metal Prints. Here are my 2018 “Views from the Flying Carpet Greatest Hits” aerial photo wall calendars, filled with my favorite aviator’s-eye views from around the country. Nearly every day of the year I hike or bike this beautiful wetlands near Flagstaff, photographing sunsets, weather phenomena, wildflowers, and birds. Once again, I’m also offering my terrestrial, 2017 “Views from Japan” photographic wall calendars. Check out my 2018 “Views from Korea” photographic wall calendars! Check out my 2018 “Well, I’ll Be!” Photo Wall Calendar, featuring some of my wackier photographs. 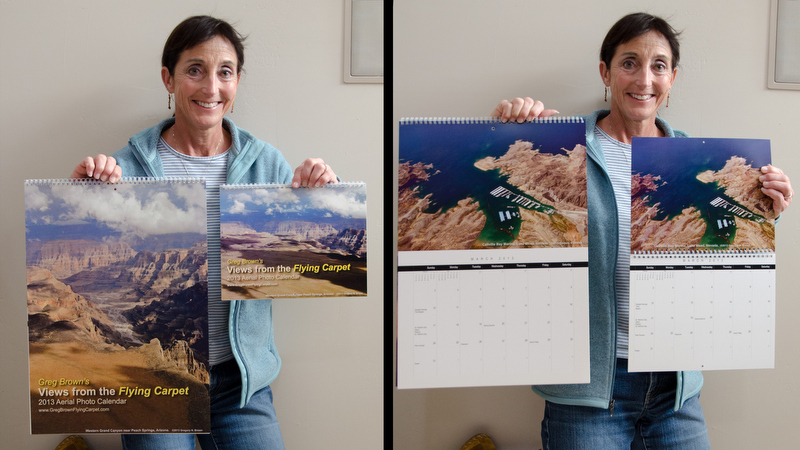 Photos for a given calendar are similar in both formats except for cover image and size. CHECK HERE FOR ANY APPLICABLE PUBLISHER DISCOUNTS! I just received your new large calendar today. Rhonda and I are so impressed by the beautiful images. You really have a talent for this. My favorite is the cover. Unless I’m mistaken, this was taken on one of our excursions into the Grand Canyon to the Bar Ten airport and dude ranch. However, the last image of the Mazatzal’s is fabulous too. The best part is the price is right. Thanks for putting in the effort.